It is one of the most acclaimed sitcoms of modern times, but the BBC turned down the chance to air Catastrophe – even though they commissioned the pilot in the first place, its creators have revealed. 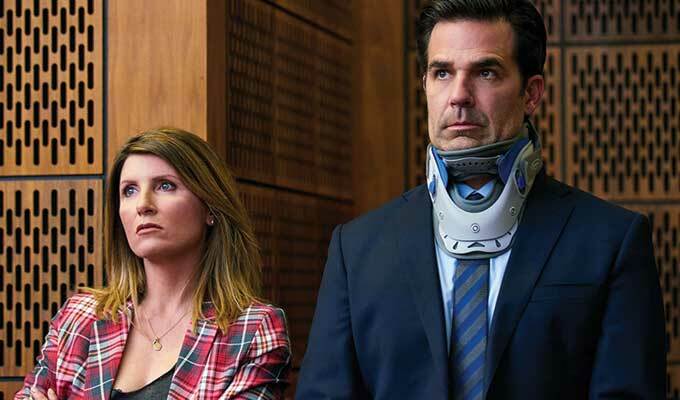 Co-star Rob Delaney joked that the Corporation had made a ‘horrible mistake’ in rejecting the script that he and Sharon Horgan wrote for them. But they praised Channel 4 for picking up the show – which is about to air its fourth and probably final series – and helping make it into the hit it became. ‘I was doing stand-up in London and my manager said, "Hey do you want to write a pilot for the BBC? ",’ Delaney recalled of the show’s genesis. ‘And I was like, "Yes of course!" ‘But I wanted it to be good so I rang Sharon and said "Let’s write a pilot together." ‘Then we gave it to the BBC, and they said, "This is great! We don’t want to make it!" Horgan also said she understood why the BBC turned Catastrophe down, suggesting that a sitcom about a husband and wife was ‘a small idea’. The pair had originally met after making contact on Twitter because of their mutual admiration. ‘It was awkward, though, wasn’t it?’ Horgan said of their first meeting in a Los Angeles hotel. They found a working routine through ‘trial and error, sitting together yakking’, Horgan says. But some practicalities soon emerged. The pair were stunned when interviewer Emma Kennedy told them that Caroline Aherne and Henry Normal only ever wrote one draft of their scripts for the Royle Family ‘because they wouldn’t take notes’ from producers or other TV executives. Although the pair like their dialogue to be naturalistic, the one thing they won’t allow is their actors to improvise. ‘Are you precious about your scripts?,’ Kennedy asked then. ’Big arseholes,’ said Delaney bluntly. ‘Our cast always bring something to the roles we’re not expecting, but they are not allowed to improvise,’ Horgan explained. ‘I think it’s hard to improvise on something really tightly scripted. They did make one exception: for Carrie Fisher, who played Rob’s mum. The pair also said they were drawing Catastrophe to a close before they tired of it. ‘We’ve been doing it for five years, we’ve made four series that we love,’ Horgan said. But he left the door open for a possible return at some point, saying: ‘Anything can happen,’ and adding that he was ‘sure’ he would work with Horgan again on something in the future. ‘I think we have a good little thing going,’ he said. Asked if they had ever considered making a movie version of Catastrophe, Delaney added: ‘We thought maybe series three was going to be a movie - and then it wasn’t. And then we did this series, which wasn’t. The fourth series marks a natural progression for their characters, who were thrown together when a one-night stand ended in pregnancy and they had to forge a relationship through the chaos of their lives. ‘At the end of series three they realised "This is our pile of garbage" ,’ Delaney said of their situation, before extending the metaphor awkwardly. ‘Now they are trying to weave it into a tapestry they can use as a blanket. And she said she had been influenced by Roseanne Barr’s self-titled sitcom, saying: ‘She was a great lead female character and in a way her gender didn’t matter at all. Catastrophe returns to Channel 4 in January. Meanwhile the first three series are available on All4.